If you are looking for a wildlife experience during your vacation in Myrtle Beach, look no further than Alligator Adventure. This one of a kind reptile experience displays animals you may not be able to see anywhere else. Alligator Adventure is located just across from Barefoot Landing in Myrtle Beach. Alligator Adventure, one of the most popular attractions in Myrtle Beach, is home to over eight hundred alligators. You will be able to see many baby alligators as small as a few inches, as well as some of the old monsters ranging up to fifteen feet and weighing in at over one thousand pounds. Throughout the day there are many lectures where you and your family will be educated on the lives of the prehistoric beasts. Feeding time usually draws a large crowd, and rightfully so because the staff will be feeding them, BY HAND! While the American alligator is the most prevalent animal in the park, you will also get a chance to get up close and personal with a couple of rare albino alligators. 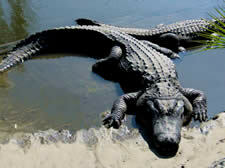 Alligator Adventure also has species of alligators from all over the world right here in Myrtle Beach, South Carolina. Crocodiles are also on display and the helpful staff will be able to tell you how to differentiate an alligator from a crocodile. One of the park's most popular animals is UTAN ? King of the Crocs, which is the largest crocodile found in the States measuring over twenty feet in length. Other animals can be seen in the various exhibits around Alligator Adventure. You will be able to see many different snakes, lizards, frogs and turtles. The massive Galapagos Tortoise, weighing up to 450 pounds, are a favorite with adults and children alike. You will also see large cats such as tigers, and smaller cats like the bobcat. Other animal exhibits are constantly being added so you can see something new each time you visit. Alligator Adventure is the perfect activity for your family to enjoy on your next Myrtle Beach vacation. 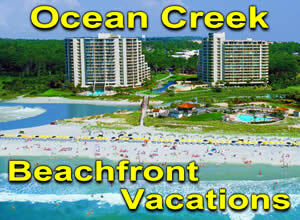 When planning your next stay, take a look at these family resorts or check out the great deals on oceanfront vacation rentals near Barefoot Landing and be close to the beach, as well as this famous zoological park.